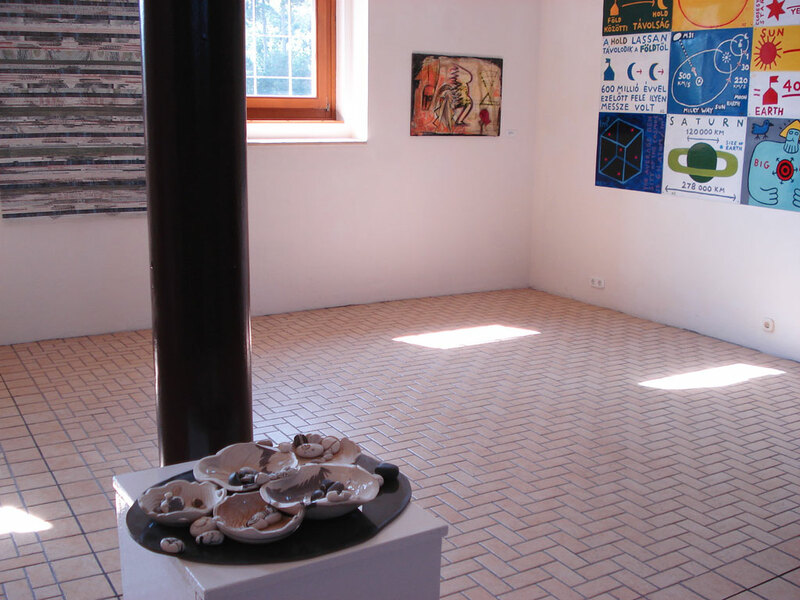 We (Mary Keczan Ebos, Judith Klugerman and I) managed to get to the exhibition in Szentendre on the last day, the 23rd of August. Judith & Mary took installation photos. The following day, Mary, Miklos Rogan and I supervised the dismounting and the wrapping of the works by the technicians, who did a great job. The transportation company came also to check the packing and to talk to the management. Keszthely couldn’t receive the box until the 31st of August but thanks to Fruzsina, Malom stored it for a week. 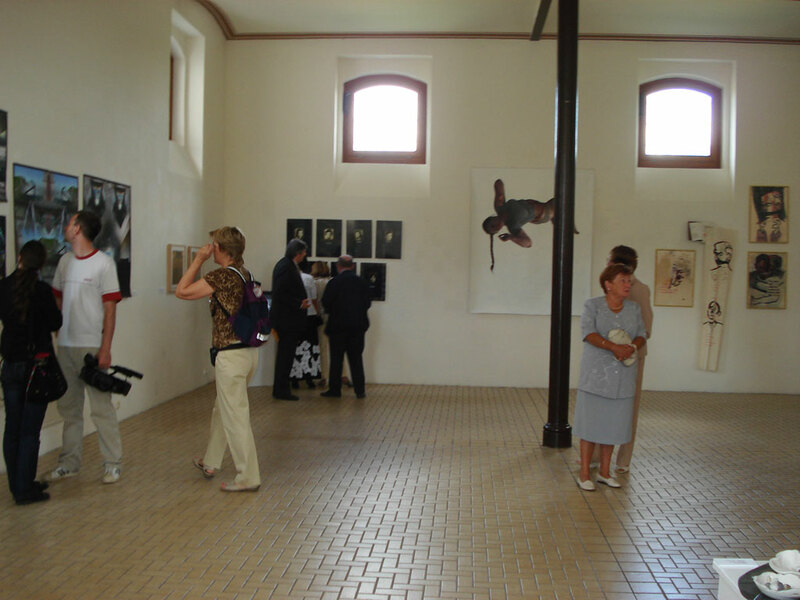 The transportation company arrived to the Kastély Múzeum with the crate on August 31st around noon. However, before unpacking everything Annamaria Bernath invited Mary, Judith, Miklos and I for a light lunch in the castle’s dining room. The technical staff was also very helpful in Keszthely. 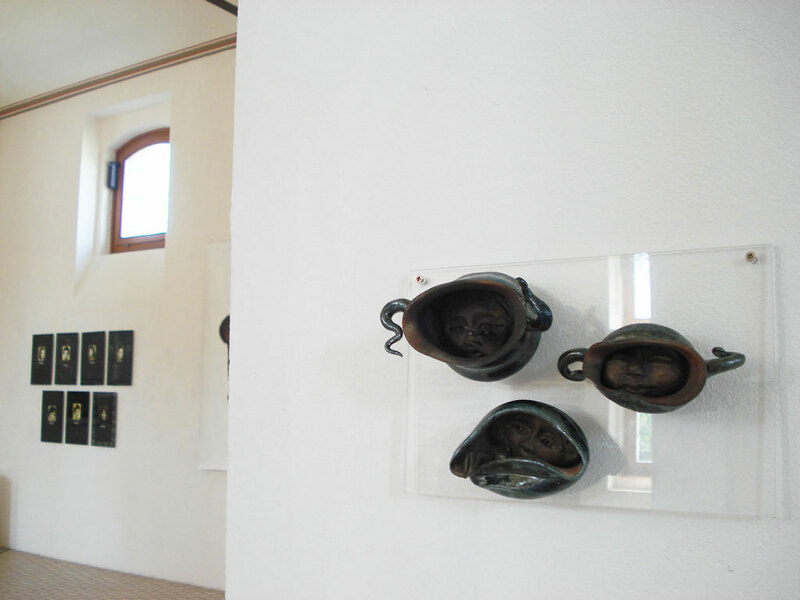 The workers installed the pieces with Mary’s and Judith’s direction. Miklos and I assisted. By Wednesday late afternoon we were ready. The administration got a DVD player and a small TV for the opening on Saturday to show Yvonne Singer’s work. We received 5 boxes of wine for the vernissage: 2 from the Canadian Embassy and 3 from different wine makers through Tony Kez, the President of the Hungarian Chamber of Commerce. 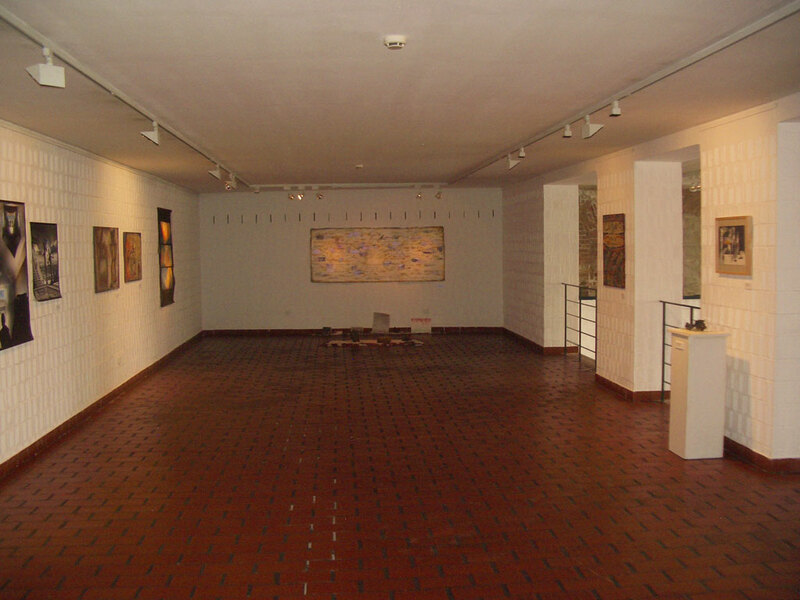 The POGÁCSA was provided by the museum. Many of our friends came to the reception; first of all Andrea Blanar’s family and friends (13) came for a wine tasting tour to Balaton: 6 Blanar-Tekker, 2 Mailath, Lengvary, Barbara’s friend J.C. and husband and Sophie Madon’s in-laws. We must have been 80 all together. Kastély director, Dr. Laszlo Czoma welcomed everyone. Andrea then thanked everyone for the opportunity of having the exhibition in a prestigious place like the Kastely. She also expressed her gratitude for the help of all the supporters who donated time and money and for the assistance of all the different officials. I translated her words into Hungarian. Mary Keczan Ebos thanked the technicians for their help. There were some reporters from the local media, radio and TV. 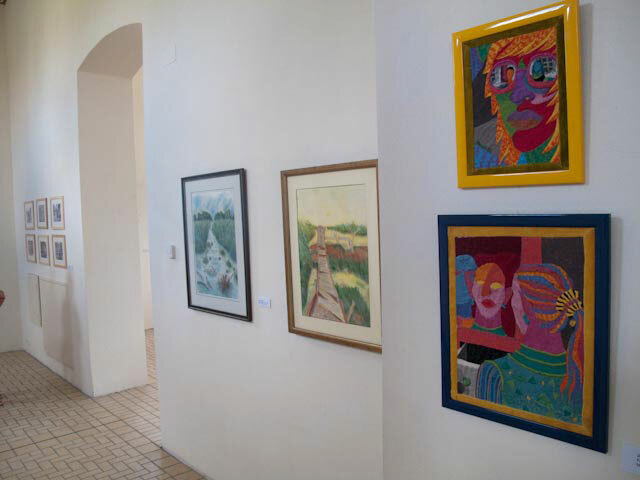 It was a nice afternoon, in a very bright museum-like setting as we sampled wines and walked from room to room enjoying the works of a talented group. 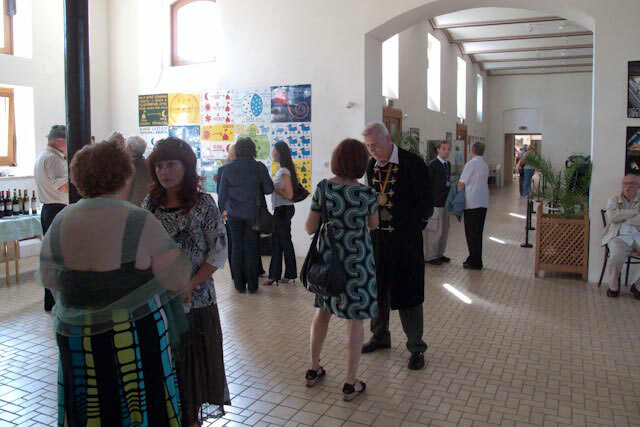 The Opening of the Exhibition was grand! Hundreds crowded about the pillars and there was a great sense of expectation & excitement in the air. From our CHAC group, present were, The Szentendre Exhibition team headed by Anna Torma with her assistants, Balint Zsako & Miklos Rogan. 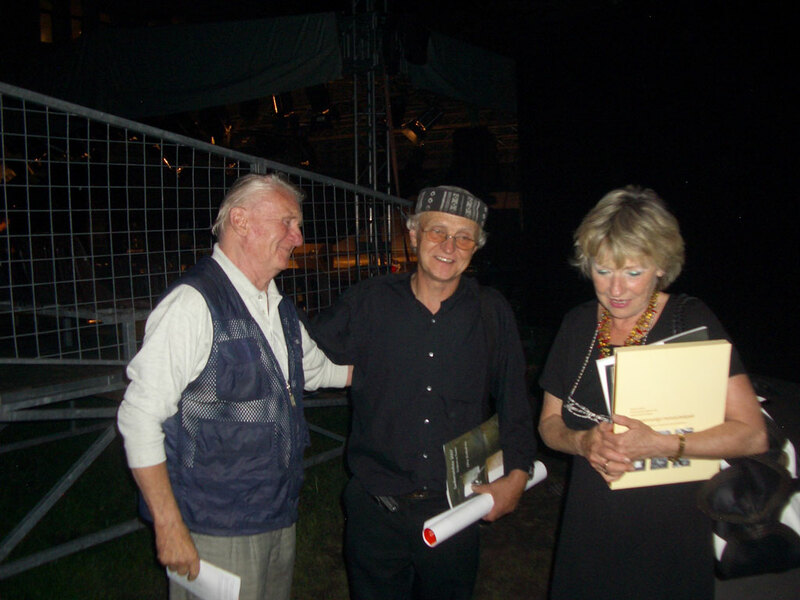 Tamas Wormser, curator of Film Festival, who was also very busy preparing promotional flyers & material and making arrangements for the film festival which was to open the following night. 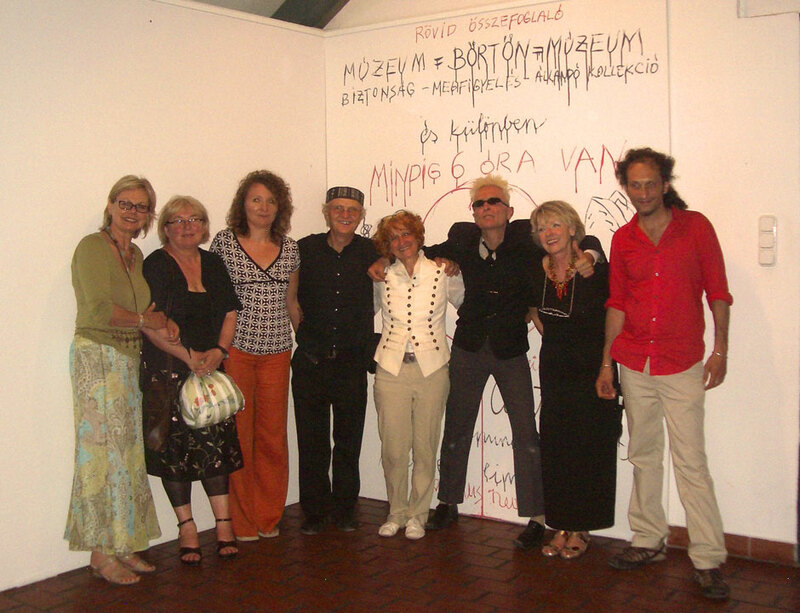 The Installation artists were of course also present, Geza Hermann, Istvan Kantor, Mary Keczan Ebos, Sheila Szabo Butler. 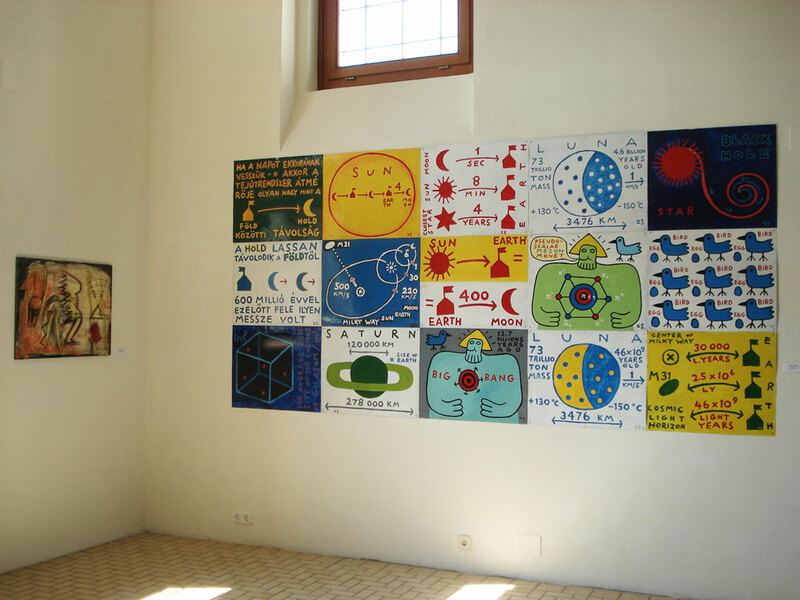 Also there were artists Sophie Fekete-Feher and Jeanette Pekari. Among the many guests we were delighted to see Marika Roy came from Montreal! 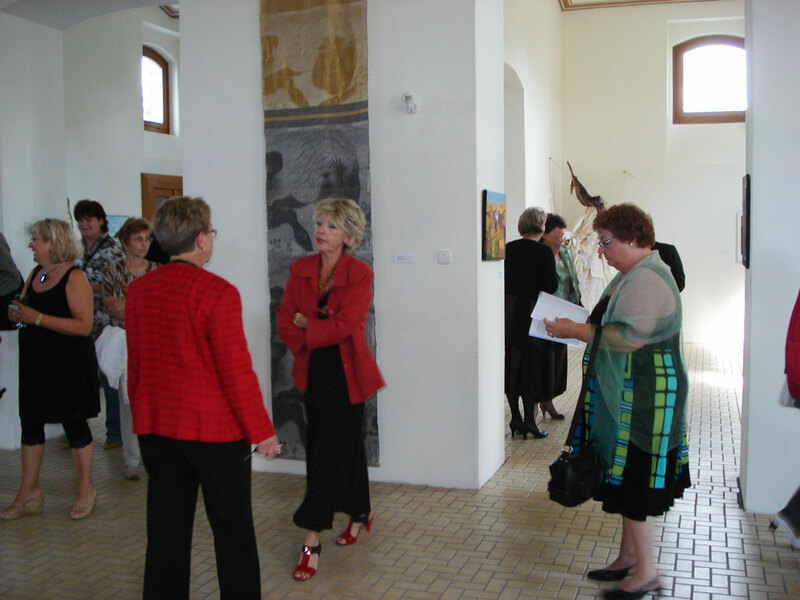 Many of the Hungarian relatives of artists were present and proud of their Canadian relatives! Interesting responses to our presence in Hungary: a few wondered why we would hyphenate our identities, others felt extremely touched that we were still connected to our roots. 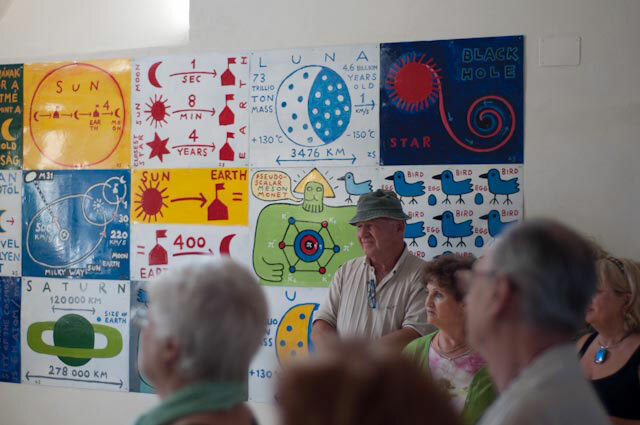 Some felt that as Canadian artists, we were a privileged lot, many wished to visit Canada, and some asked for information on promoting their work in Canada. A few wished to become CHAC members. The opening reception was quite formal. We were pleased to have Laszlo Pap, previously Hungary’s Consul in Montreal, as the Master Of Ceremonies, introducing all the speakers. The first speaker and the Sponsor of the Opening was HE Pierre Guimond, our gracious Canadian Ambassador. His pride in our project and his warmth toward our group set the tone for the exhibition. He brought with him a large Quebec contingent of family members, especially important to us as so many of our artists are Quebecers. He related the story of our first meeting with him at Foyer Hongrois, in Montreal, how he immediate realized the importance of this Canada- Hungary project and immediately gave it his full support. 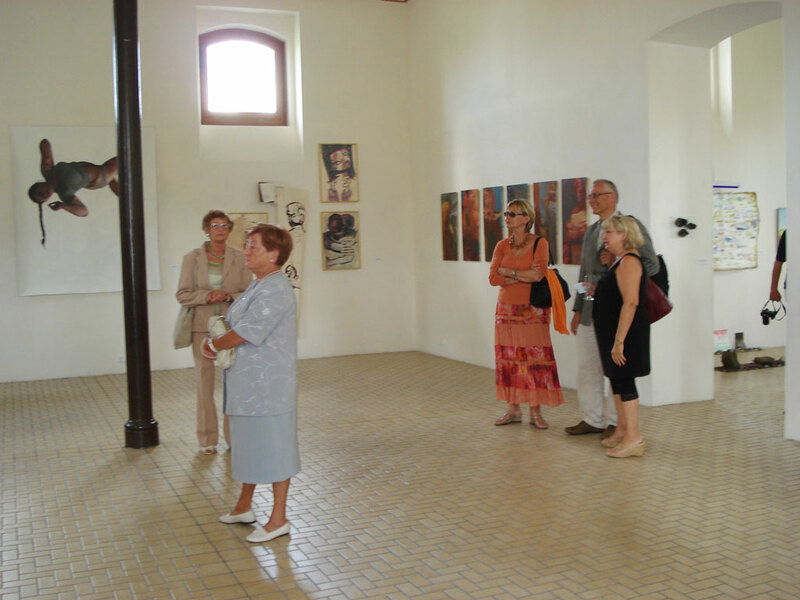 He welcomed to guests to follow the tour to its next venue in Keszthely. Eszter Rode was the next speaker, representing Ferenc Csak the Secretary of State for Education and Culture She spoke eloquently of the importance that Hungary has set in prioritizing cultural exchanges with Canada, and the role that culture plays in enhancing other collaborations. She stated that our project was typical of the type of project that they felt was important to promote. She regretted the mishaps that had occurred and stated that these were in total opposition to their ministries goals. She so graciously underscored the value that Hungary places on cultural ties to Canada. The Mayor, Ferenc Dietz, was next. 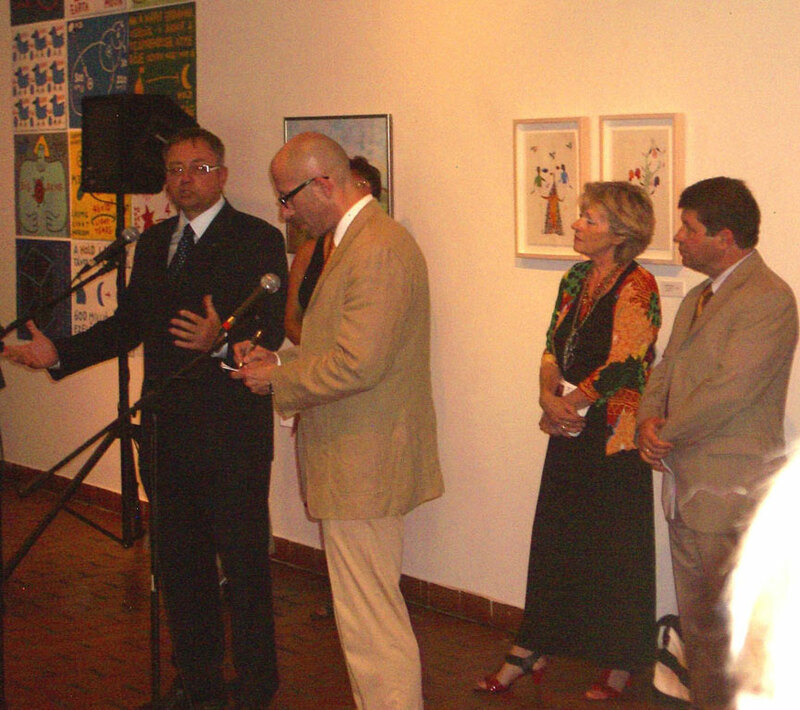 He spoke at length of his accomplishments as Mayor in the promotion of international cultural projects. 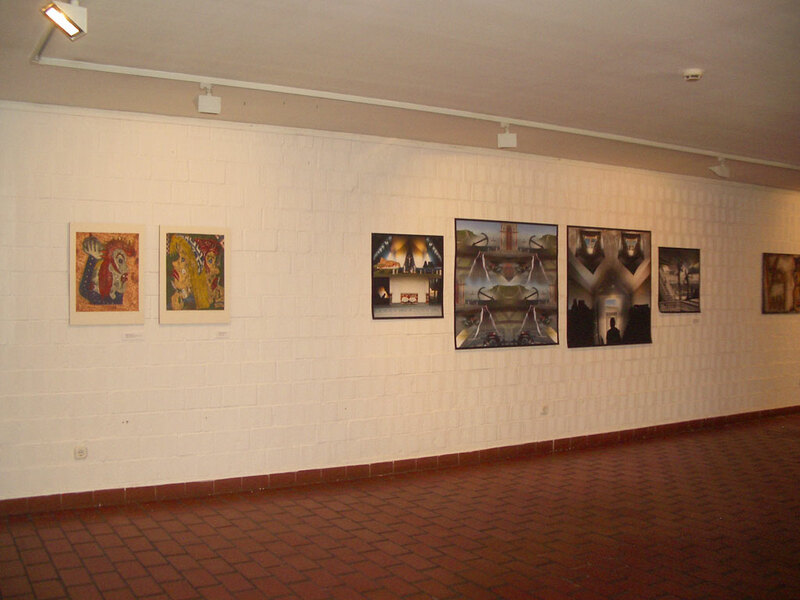 He apologized to the assembly for any pain that may have been caused to others by the postponement of the exhibition and stated that the current time slot that was the best, as so may people would be visiting the city and attending the many festivals that were taking place in Szetendre over the summer. I spoke next, about the many challenges of the tour, of the stubborn resolve that was needed to persist in a declining economic climate. I thanked all our sponsors, collaborators, donors. 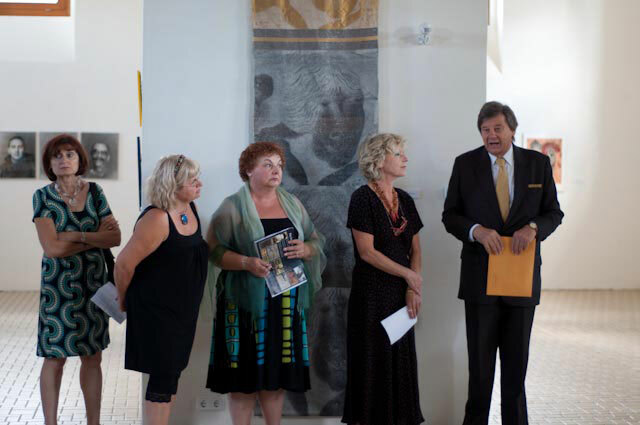 In particular I thanked and introduced the committee and artists who were present. Of course Anna Torma, as she had so successfully hung a very complex exhibition and Tamas Wormser our film Festival curator, followed by all the others that were listed above. 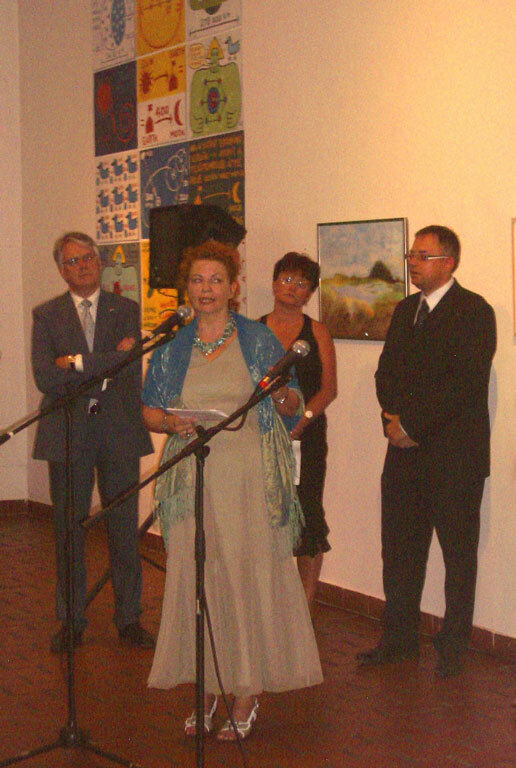 I thanked Eszter Rode, Klara Houdra, and Katalin Csoma at the Canadian Embassy for the role that they played in the realization of this exhibition. I also thanked the 2 coordinators, Fruzsina Szallay, at the MuveszetMalom in the Szentendre and Annamaria Bernath at the Helikon Kastely Muzeum in Keszthely. I ended with a major thank you to our sponsors Quebec Government, and Pierre Guimond the Canadian Ambassador! We were greatly honored to have Klara Houdra, a highly regarded art historian in Hungary, as key note speaker, who next addressed the assembly. The day before the opening, she had toured the gallery with Anna Torma. 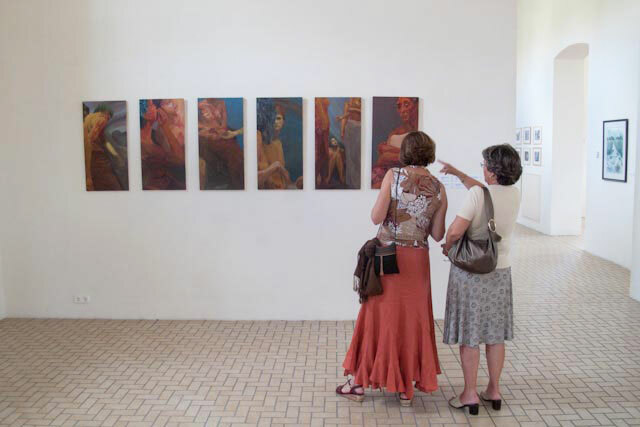 Klara presented a comprehensive review of the exhibition that is to appear in the September issue of Hungary’s arts magazine. Her analysis was multilayered and truly understanding the intent and process of the artists and the meaning of the exhibition. We are hoping that the transcript of her essay will be available for our websites and for possible publication in a Canadian arts magazine. 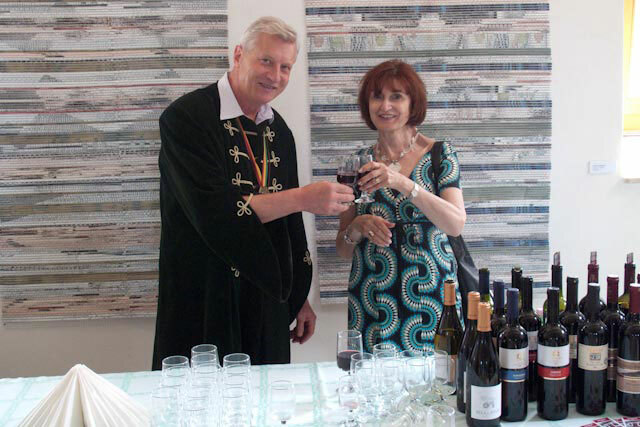 The reception ended with best wishes from Laszlo Pap and refreshments were then served. We all then gathered in the vast loft gallery space to view Istvan Kantor’s Performance which began at 9 pm. FIRST THANK YOU ANNA TORMA! She and her Team, Balint Zsako & Nathalie and Miklos Rogan successfully hung close to 100 works! Anna, coordinator for the SzentendreVenue, treated this exhibition’s hanging much as she structures her own work with delicacy & boldness. Everything flowed perfectly – every huge space was an immediate shock of wonder that arrested you! Not one work seemed out of place & no one was neglected! Here are some of my outstanding memories. 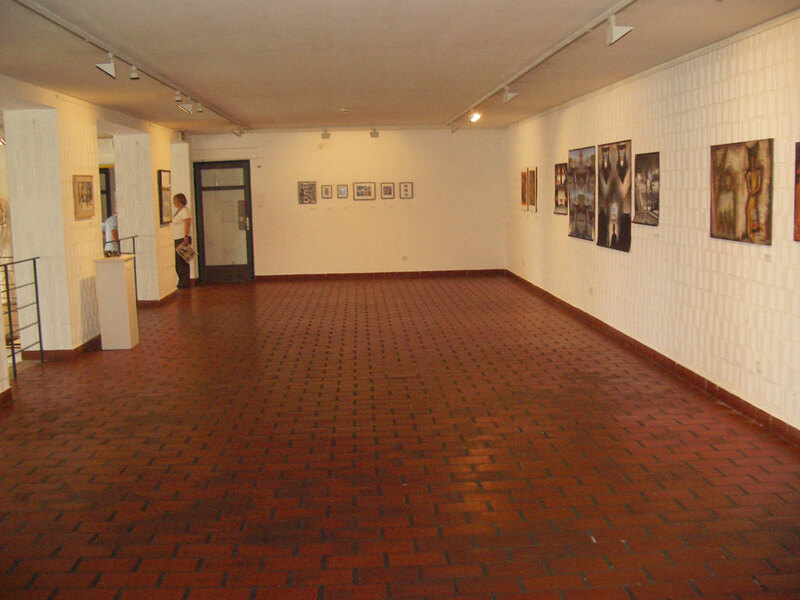 All of the exhibition spaces & stairwells are open -connected spaces. 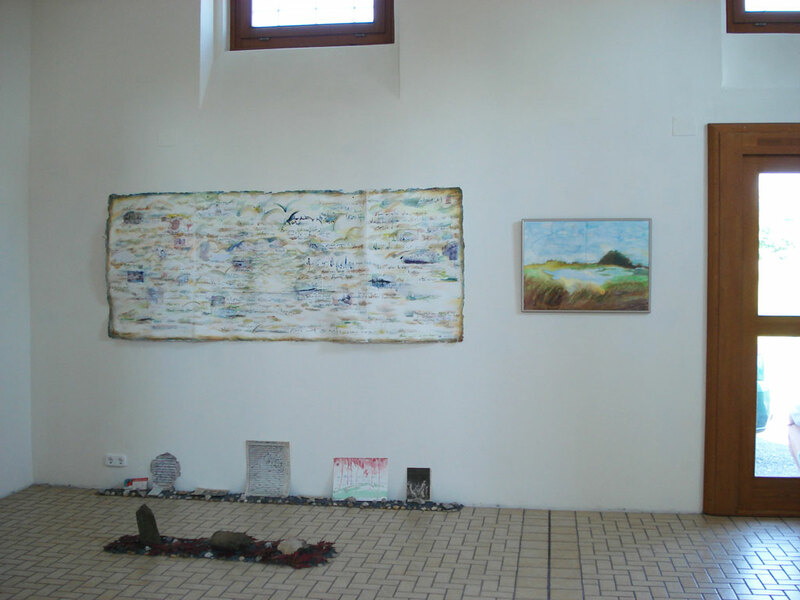 Anna Biro’s work welcomed the viewers at the front entrance, rising to the ceiling and as one climbed into the mezzanine spaces one viewed a Rogan Laurentian landscape and then Emilia Kun’s impressive large textile. As one entered the first floor galleries, one stepped into the gallery on the left side, but through the wide columns on the right, one could view the works in the atrium, the cathedral ceiling gallery on the right. 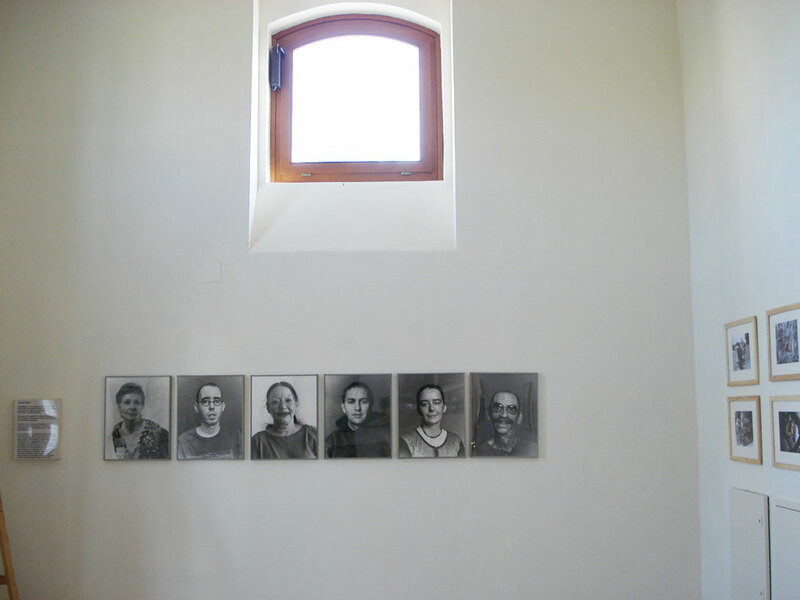 In the left-side gallery, one faced Clarissa Inglis’s stunning immigration series on the entire back wall. 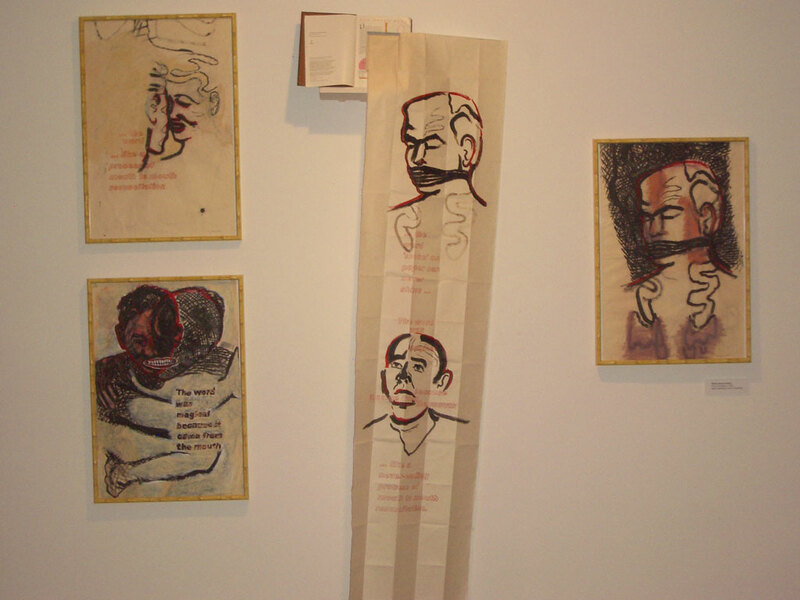 Jutting out on the right, on a wide column, was the installation book work of Sheila Szabo Butler, surrounded by her large sketches, the drawings that were the basis of the bookwork. 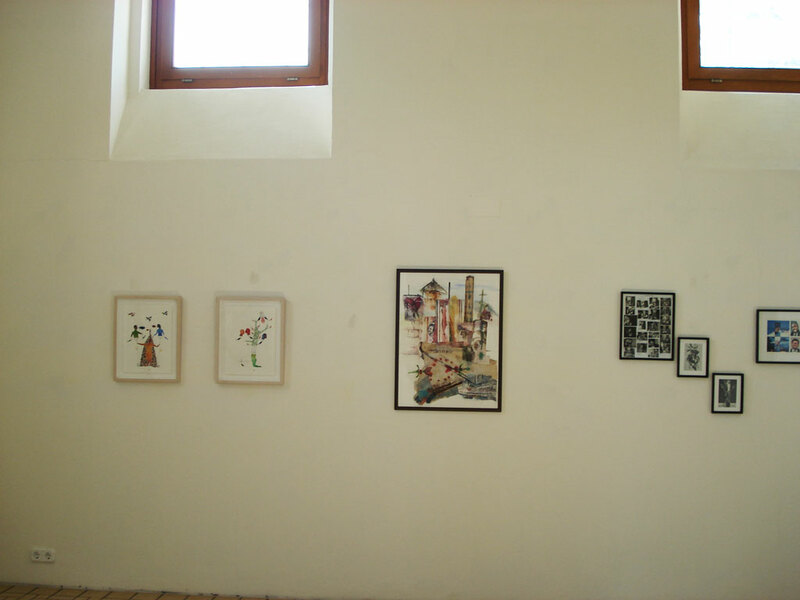 On the front wall were the delicately fragmented collages of Andrea Szilasi & on a pedestal the work of Eva Ferenczi Reichmann. 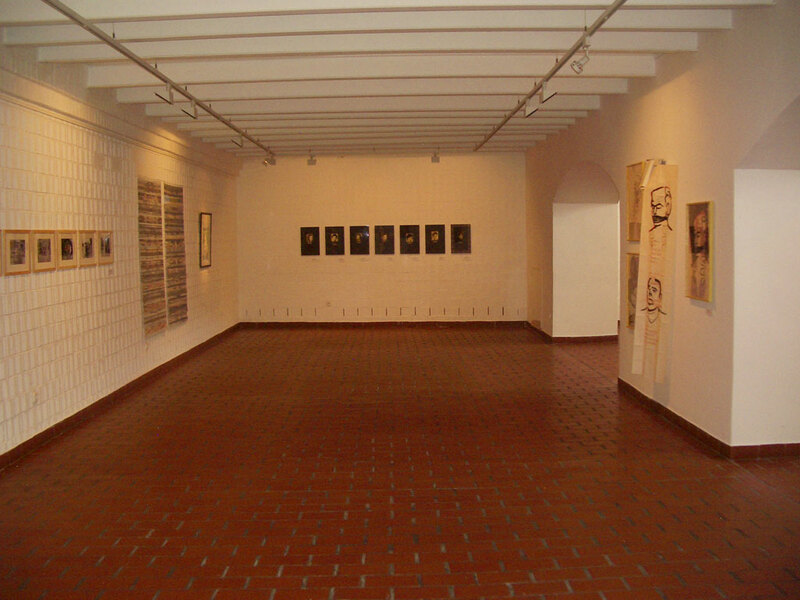 The long wall greeting us on the left was stunning with the works of Sophie Fekete, Judith Klugermann and Julia Ciammara and on the right side, on the wide columns connecting to the atrium gallery was the very colorful work of Jeanette Pekari & the more contemplative work of Miklos Rogan. The Atrium Cathedral: This vast space has an overhanging open balcony that links the first & second floor. 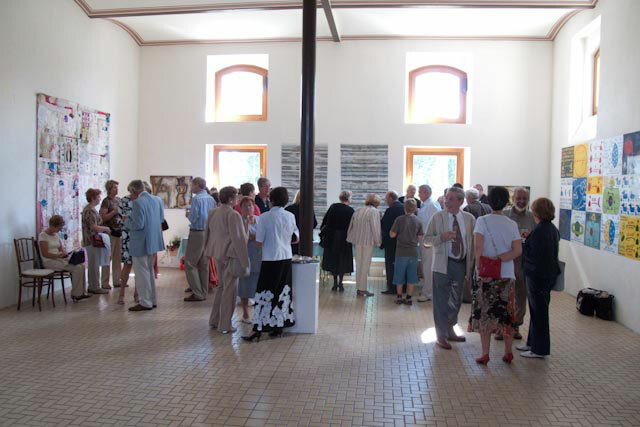 The opening reception speeches were held in this space and the spectators stood before and between the columns. 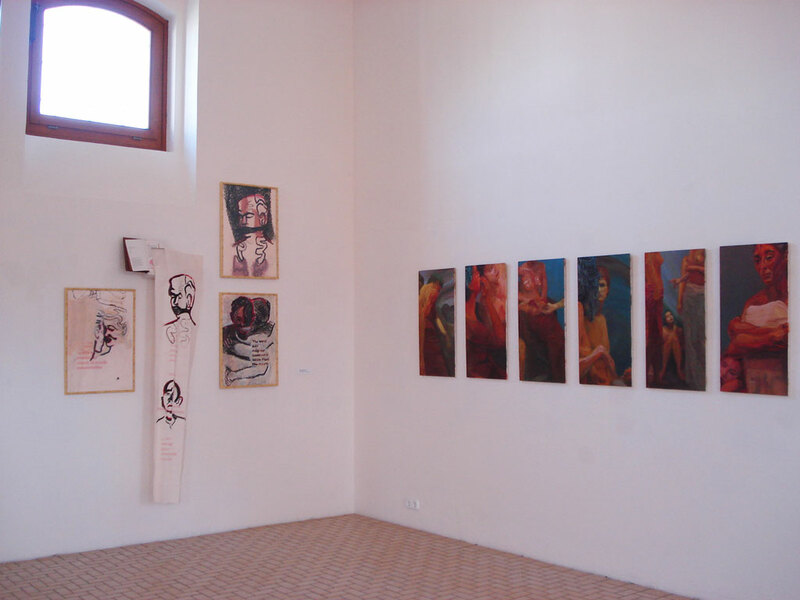 Anna planned this space perfectly with all of the larger works. 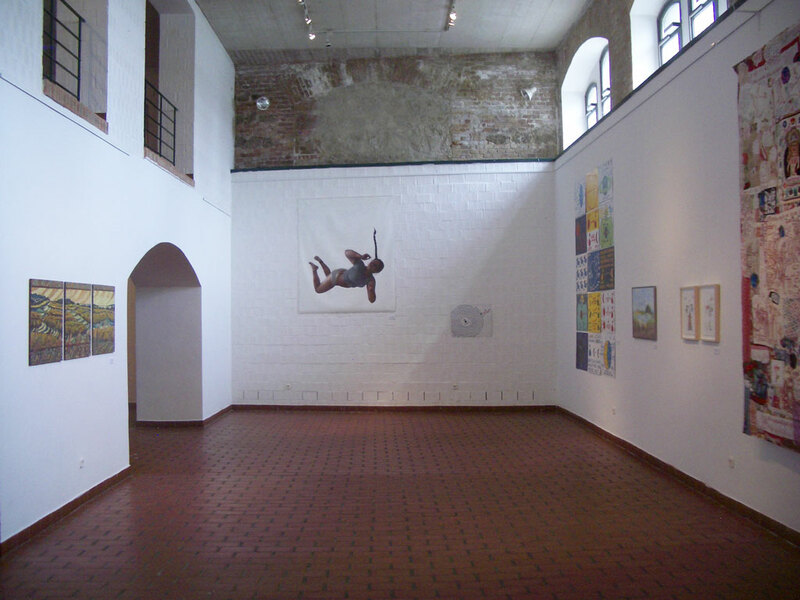 The back wall facing us had Kristi Ropeleski’s magical floating work that reinforced the airiness of this space- A small Zsako Istvan work connected at the corner to the long wall on the right. The works on this long wall could be seen through the columns as one entered the exhibition’s spaces: the monumental incredible textile diptych by Anna Torma, which was counterbalanced by Istvan Zsako’s giant playful checquer board metal paintings. 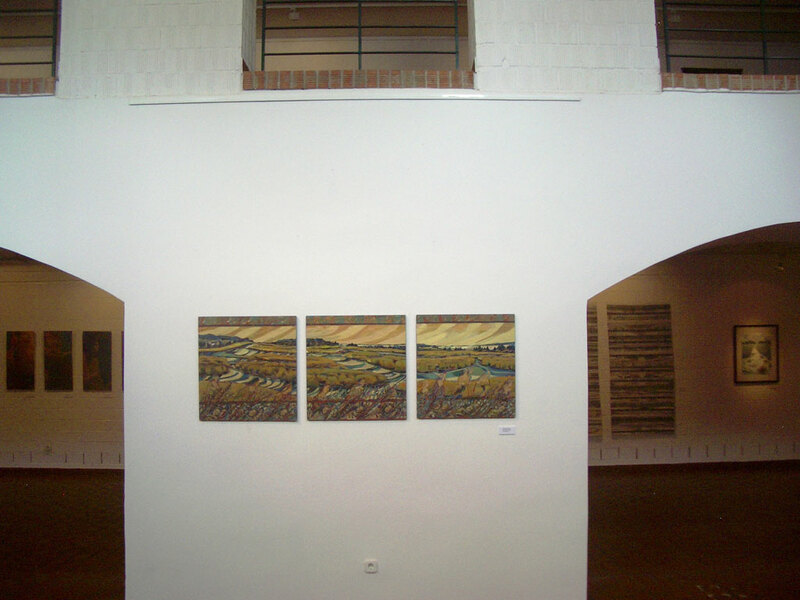 These were linked by Agi Szeben’s intimate view of the Tantramar marsh, which depict an area next to Istvan & Anna’s farmhouse in NB and by Balint Zsako’s miniature works that held their ground next to the surrounding monumental works. 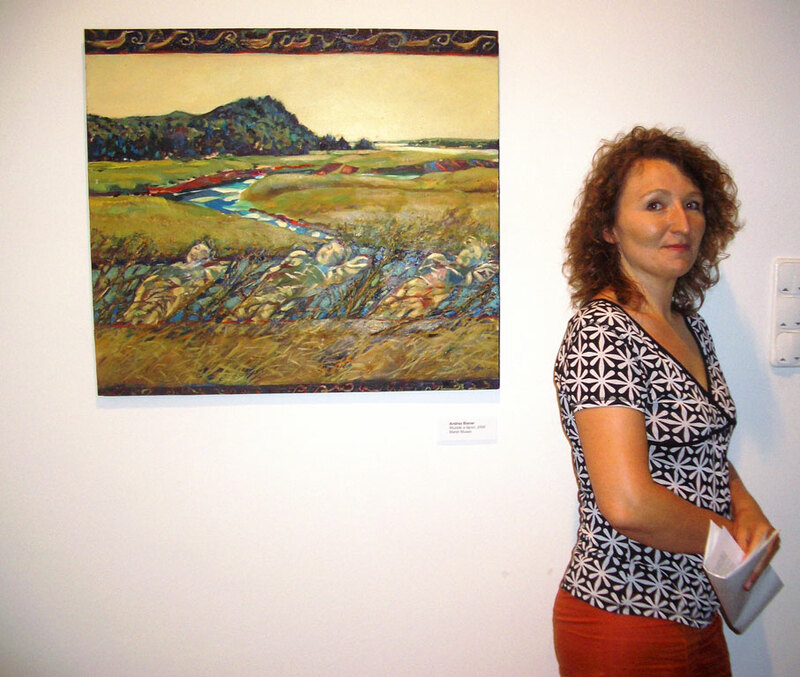 The 2 golden grasses by Doreen Lindsay Szilasi came next echoing the yellow of Agi’s grasses. 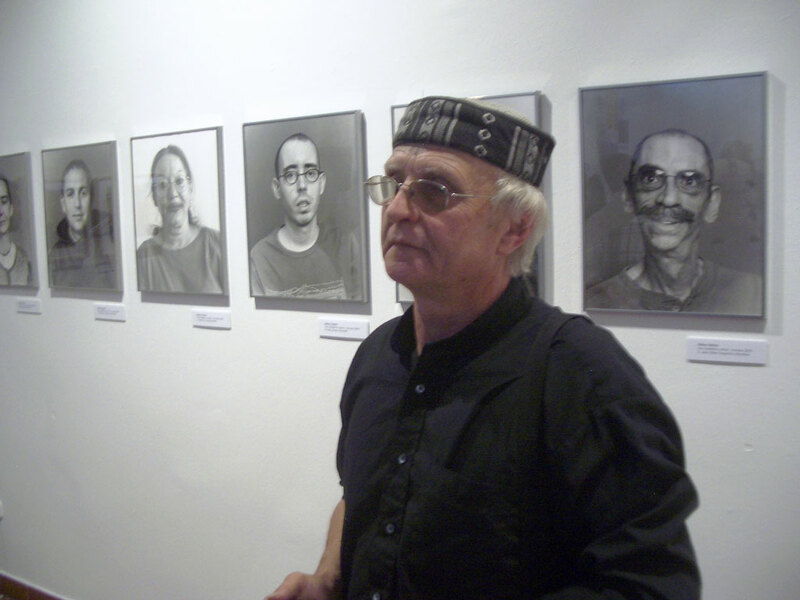 Next, along the entire the front wall of the atrium gallery were Gabor Szilasi’s moving photographs of Les Impatiens artists. Set against the columns that separate the 2 galleries were Andrea Blanar’s NB marshes, facing Doreen’s and Agi Szeben’s grasses. As one looked upward into to the suspended balcony, one saw on the second floor Mary Keczan’s Ebos’ painterly installation, a delicate wedding dress of frothy lace, of Hungarian embroideries, with floating letters of Hungarian relatives tucked into the folds- all of the installation was in stark white except at the apex, a brown textile mysterious bird, took the dress upward into flight. As one entered, Geza Hermann’s masterpiece, ultraviolet work along the back wall, set the tone of the room. Geza placed his floor installation of Hungarian pebbles and Canadian maple leaves under his wall piece. The light from the Hermann work spilt over into the long wall on the left, dramatically illuminating Andrea de Gosztonyi’s fiery work. Next in red & blue rhythms down that long wall, coming towards the front were the works of Sandor Sipos reminiscent of cave drawings, the luminous window-like photomontages of Alex Brzezinski, the intimate photoseries of David Zsako’s family in Hungary, in their ancestral settings, and at the front entrance, Maria Jankovics’ bold reds. 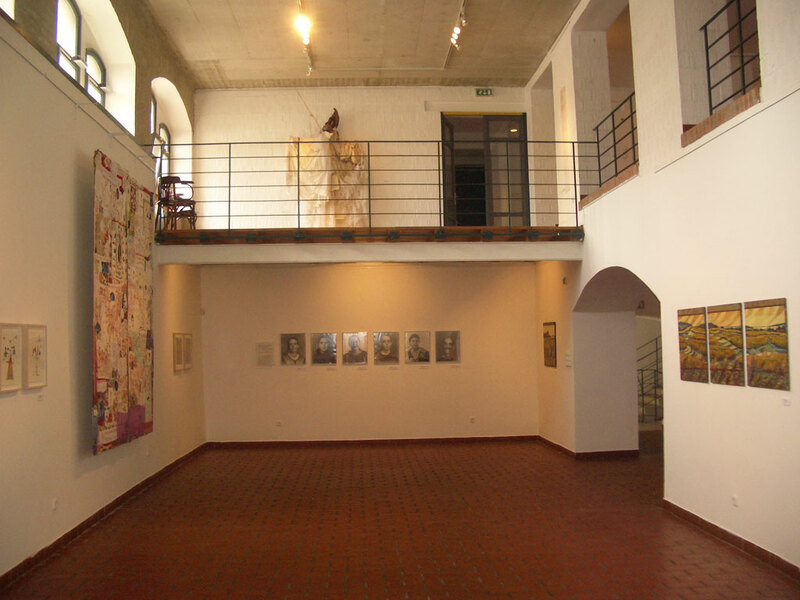 Miklos Rogan occupied the front wall and on the right, on the wide column, were delicate works of Peter Pusztai with Agi Zoni’s pebbles work sitting on a pedestal under his work. The entire galleries on both sides of the landing were dedicated to the work of Istvan Kantor one side was a retrospective, the other was set aside for his performance that took place at 9 pm after the opening ceremonies & reception. 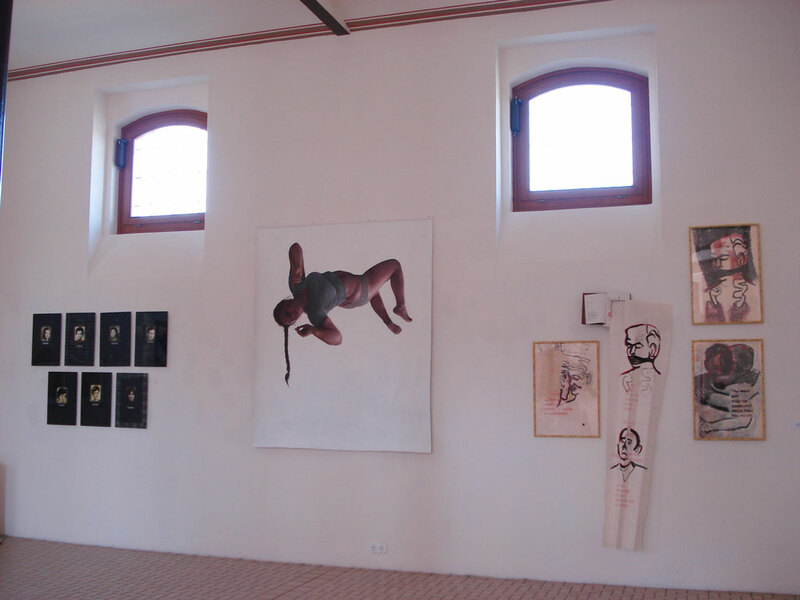 Kantor’s installation occupied the entire vast space! 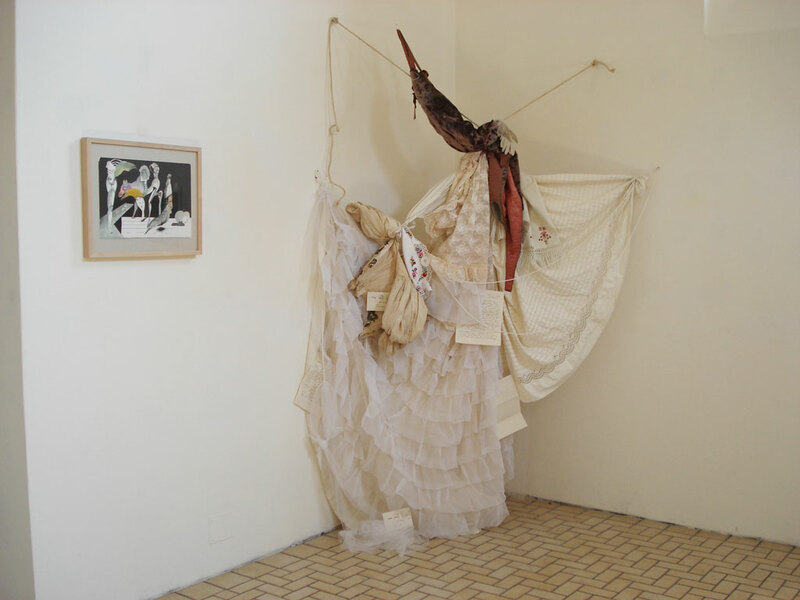 He displayed books, his writings, diaries, documents collected and regurgitated with overlays, notebooks, paintings drawings posters an installation of a library that summarized his revolutionary work. The Performance created incredible challenges for Kantor, which he successfully resolved. He had to single-handedly perform, do the audio-visuals, occupy and move about the almost stadium like spaces and keep the attention of an audience that was spread across the length of the space. My favorites were as usual his physical insertion and interaction with his own films projected on the Back wall podium, and his singing of Hungarian songs at the end! His Films are riveting!!!! We really thank him for transporting so much material to the gallery and for giving us the grand finale of an opening none of us will ever forget! Thank you Istvan Kantor! -The lengthy opening ceremonies, unfortunately led to the disappearance of many guests. It was to be expected that the first venue would be the most formal and that the subsequent venues would have a more informal atmosphere. – The flooding of the Danube created incredible traffic jams, as the fast access roads on either side of the Danube were under water! This discouraged some attendance, others taking the train left early. 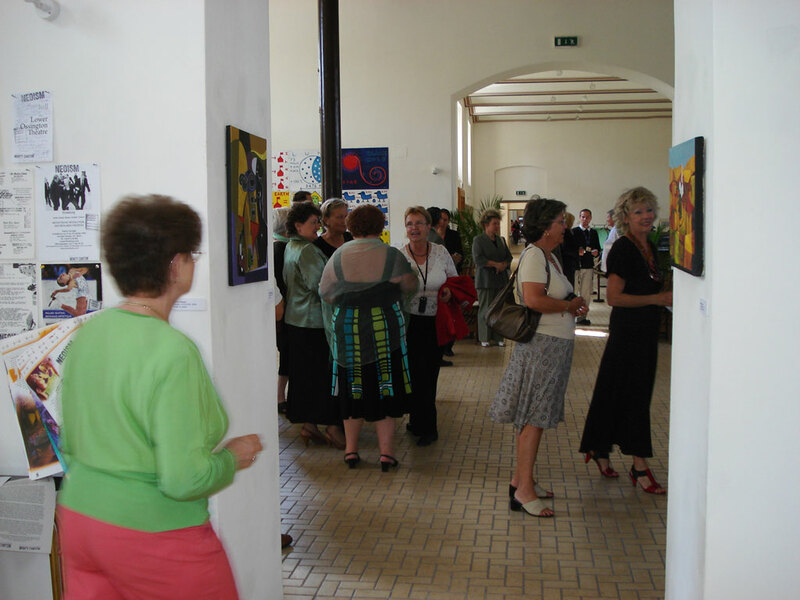 -The absence of Hungarian artists & the Hungarian arts circle was explained to me as being caused by a competing arts event that was scheduled for the same night as our opening. -FILM FESTIVAl: Tamas Wormser, Film Curator, has at first reported a rather poor attendance at the film festival, this despite every restaurant shop hotel –penzion having a stack of our flyers. But we are there at a difficult time- people seem distracted by the politics, by the flooding of the Danube, the traffic jams that negatively affected the driving to Szentendre. 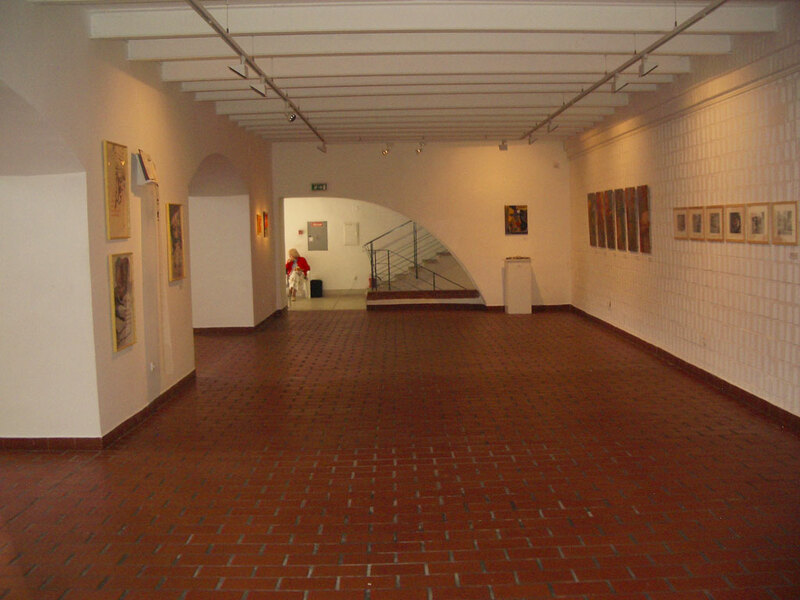 As well, Szentendre has many other major national theatre & cultural events that are being concurrently organized. This may lead to an increase in attendance at the exhibition but may have taken the interest away from the film festival. Certainly there was a great deal of PR that was done prior to the festival; Tamas was on National TV the week before and a zillion e-mails were sent. The film Festival was on websites in Canada and Hungary. Nagykövetség és az Oktatási és Kulturális Minisztérium.